Google Classroom has recently added a set of interesting new features that we have covered in an earlier post here in EdTech and Learning. 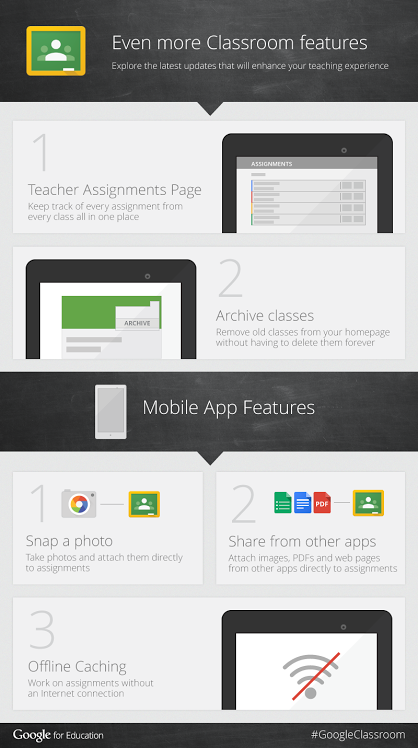 Google for Education has also created this beautiful visual capturing the latest updates in Google Classroom. We thought you might want to have a look. Allows you to access and keep track of your students' assignments from one single platform. Allows you to organize your classes in your homepage by temporarily deleting old classes. You can now snap a photo using Google Classroom mobile apps and instantly add it to your assignments. This is another new feature for Classroom mobile apps which allow you to share images, PDFs, and web pages from other apps directly to your assignments. This one allows you to work on assignments without Internet connect.